Hi ladies, finally after what seems to be an eternity, the much-talked about The Last Unicorn Tour will come to Germany in July! 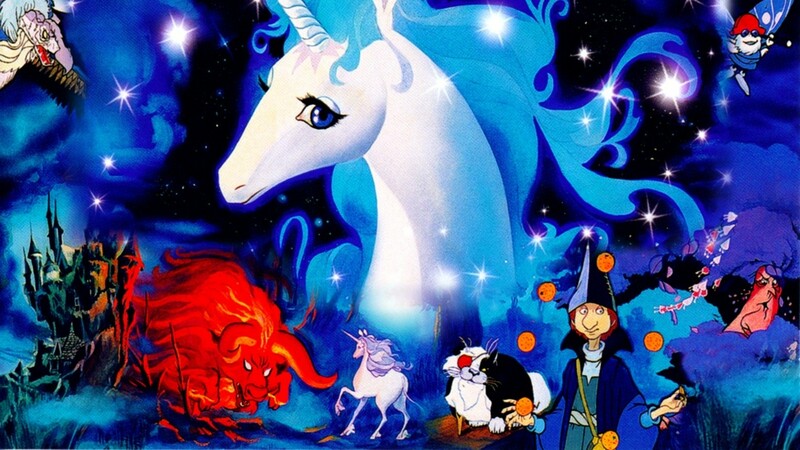 For everyone who doesn't know, The Last Unicorn is a famous high fantasy story that was adapted into an animation film in 1982. The film has now been digitally remastered and is brought back to the screen across the globe. Author and Lord of the Rings screenplay writer Peter S. Beagle will be joining the tour and fans can get their hands on some exclusive merchandise. The tour started back in 2013 but has been in the US for most of the time. Originally planned to run for two years, but due to popular demand, it has no extended to 2016. Peter and his team will come to Europe for a few months and the dates for Germany have been released. Why is the tour so special I hear you ask? The film has been digitally remastered and Peter himself will be there. He will be signing DVDs, posters and books and talk to fans. I can imagine there will be an awful lot of special merchandising on sale, too. You can be sure I'm going to spend a little fortune. I was six years old when I fell in love with the unicorn for the very first time. Do you know the feeling when you watched a film and identified with it for all of your life? The Last Unicorn is one of these films to me. It has had an impact on my life and shaped my way of thinking. It is hard for me to recount how many times I've seen the animation and read the book. I've completely internalised the story and its message. I know the film is a bit strange and very demanding for children, but it is full of poetry and valuable life lessons. The tour will come to Berlin soon and I bought my ticket for the 3rd July (ticket price 12 €/£10). Further stops in Germany include my former home Leipzig, Garbsen, Dortmund, Erlangen and Munich. I'm sure dates for the UK will be announced shortly. From what I've seen and read online so far, the tour is a massive success and I would hate myself forever if I missed out on the chance to be a part of it. There's the chance to volunteer at the event and you can sign up to their newsletter online for more information and support. You can imagine how excited I am for this. I've been following the tour from the early days and ever since I've been dying for the tour to come over to Europe. Many times the dates have been postponed and now it is finally happening. I hope to get a chance to speak to Peter after the event and there will be a follow-up post for you. Update 10/07: Sadly, Peter couldn't make it to Germany due to health reasons. I hope he will get well soon, but the tour didn't take place in the way, it was advertised and how I've seen it executed in the US. In Germany, they would only show the film and there was no team around selling merchandise or other interactions with fans. I feel this is a bit unfair towards fans living in Europe who would have supported the tour and would have loved to meet the team and experience the vibe and share the love for the film how it was meant to be. Thank you so much for reading today's post and I hope you'll join The Last Unicorn or have already !?! Let me know I'd love to know if you're a fan of the fantasy story or were lucky to meet Peter and the team. Is there a film that has impacted your life or you grew up with and can rewatch over and over again?